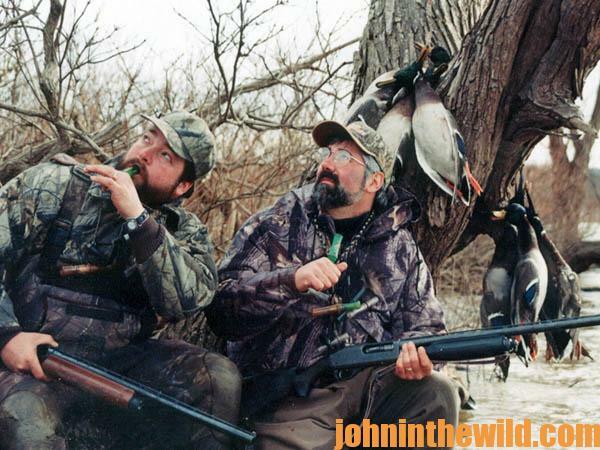 John’s Note: I really enjoy classic waterfowling. I like hunting from a blind, using 50 or more decoys, having a retriever pick-up the ducks and sharing the experience with a good hunting buddy. However, classic waterfowling requires too much equipment and doesn’t allow me as much mobility as I have when surprising ducks in flooded timber. 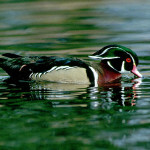 Open-water hunting for waterfowl also requires that you live near or travel to big water. Throughout most of the South where I live, you’ll find little potholes and streams, flooded-timber areas and woods ponds where ducks will feed and hold, especially during a cold winter. You can hunt anywhere where you find enough water to float ducks and enough food to feed them. I enjoy hunting ducks. When I make a long stalk to take birds as they come off the water, I feel more satisfied than I do when I put out a decoy spread and blow a duck call, until some feathered phantom gets curious enough to see what’s happening. If you want to enjoy waterfowling without all the hassles, try these surprise tactics to take webfoots. Floating down small streams, creeks and waterways can produce outstanding duck hunting on windy days when the big water is rough or after extremely cold weather that has lasted for several days, icing over all the small ponds and backwater sloughs. Often you’ll find the ducks have ganged-up and piled into little streams and creeks that flow into major waterways on those days. By using a flat-bottomed johnboat or a small canoe, you can float down these little tributaries for some rewarding duck hunting. I enjoy buddy hunting in a canoe and jump shooting ducks. 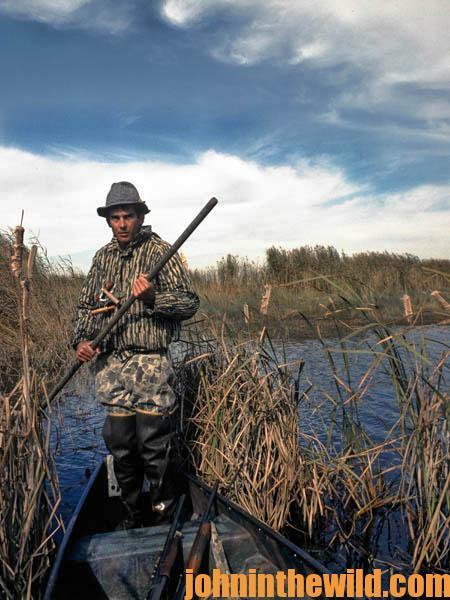 Four hunters and two canoes can take more ducks than two people and a boat. Here’s the strategy we use. The first boat launches and paddles downstream 30 to 45 minutes ahead of the second boat. As the first boat jumps the ducks, many birds will fly downstream, circle and fly upstream behind the first boat. By the time the second boat launches, the first flight of ducks either will have settled on the water or will fly toward the second boat. This tactic enables both groups of hunters to see and bag more ducks on a float trip than either group will take floating small streams by itself. 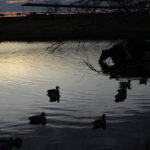 You can utilize jump-shooting methods to take ducks at three places and times of day. 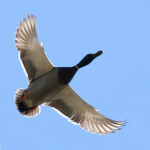 *Early-Morning Feeding Sites – Early in the morning, often before legal shooting hours, ducks will fly into a shallow-water feeding site. 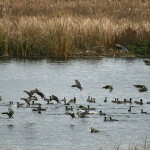 By the time the sun makes its appearance, you may encounter most of the ducks at the feeding site already on the water. 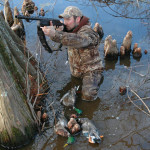 If you stalk into the feeding area to approach the ducks by water, begin your stalk at least 100-yards from the ducks. Remain out of the ducks’ sight when you enter the water. As you move closer to the webfoots, study the trees standing in the water in front of you. Calculate which direction will provide you with the most cover as you approach the ducks. As you move through the water, assume the ducks will be looking at you. Often the ducks will stay in an area like this until 9:00 or 10:00 am. But in bad weather with blowing wind and rough big water, the ducks may remain at the feeding site all day. If the ducks find all the shallow-water ponds frozen, they may stay in an open-water feeding area or a small creek all day. On bad days, ducks will come in and out of a feeding site so frequently that you’ll get plenty of pass shooting, even if you haven’t honed your stalking skills. To learn more about preparing ducks and other wild game besides seafood and fish from our family’s recipes from the past 45+ years, get John and Denise Phillips’ new eBook “The Best Wild Game & Seafood Cookbook Ever: 350 Southern Recipes for Deer, Turkey, Fish, Seafood, Small Game and Birds.” Click here to get this book.